I am a Form 5 student. My name is Will, Will Lee. I had been living a normal life just like everyone at my age was -- I go to school, finish school assignments every day, and prepare for upcoming tests or exams afterwards -- until that day. It was a beautiful sunny morning when I went to school. But after school, there were some dark clouds first, then came the pouring rain. I did not bring an umbrella. Luckily, my school was near the MTR(Mass Transit Railway) station, so that I could walk my way without getting wet. Then I got on the train at Hong Kong station. Since there were not many people in the compartment at the time, I took a seat and began to sleep after a tiring day of school. 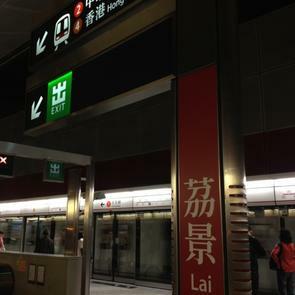 "Next station: Lai King. Interchange station for the Tsuen Wan line towards Tsuen Wan." The woman's voice in the announcement was too soft to wake me from my daydream. I thought I heard the words "Lai King", or maybe I just heard it wrong. What if she really said so, then I must wake up and get off the train in order to go home. My mom said she was going to prepare a pickled pork tonight. Right, wake up, Will! The door was about to open. I woke, I got up, and I stepped out of the compartment door as I forced opening my eyes to get my vision back. I saw people waiting in line, ready to get in on the train. Something looked different and I had no time to question but kept my eyes open on the surrounding. Before I could utter a word, the scene in front of me faded, diminished. It started to ebb away like weakening tide. It was no platform. I had never seen such a place in my life. "What is this place?" I finally said something in astonishment. Deadline Chaser or DEADline Chaser?